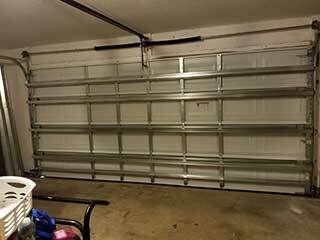 All garage door systems rely on springs to help support and balance the panels as they move. However, these components are put under a huge amount of strain each time the system operates, and while they’re designed to last for several thousand cycles they will eventually wear out. When they fail it can be extremely dangerous, and it will usually make your door impossible to use. Our team provides a fast and effective replacement service for both torsion and extension springs, so you can count on us for assistance with these important yet dangerous units. Even if your door has two extension springs rather than a single torsion unit, do not try to force it to open or close when one of these components breaks; this puts a huge amount of strain on the rest of the system, and can easily cause a more severe breakdown, or result in a personal injury. Our technicians will safely disconnect the damaged component and install a replacement in its place, ensuring the tension is carefully adjusted to keep the door perfectly balanced. A broken spring is difficult to deal with, and we strongly recommend getting these components replaced if they’re showing signs that they’re about to break. Watch out for signs that your door isn’t balancing properly, especially if it’s wobbling and sagging visibly while it's in motion. If this is the case, contact our team immediately - don’t try to perform the spring replacement by yourself. These devices can be very dangerous if not handled by trained professionals. Although these units only have a limited service life, their longevity can easily be extended by maintaining them regularly. Our team specializes in performing this service, which includes lubrication that ensures smooth operation and minimal corrosion, and careful tension adjustments. If you need emergency broken spring replacement, some expert maintenance and advice, give our team at Garage Door Repair Orange Park a call. We’re always happy to help local homeowners deal with these dangerous devices.